Be careful what you wish for. 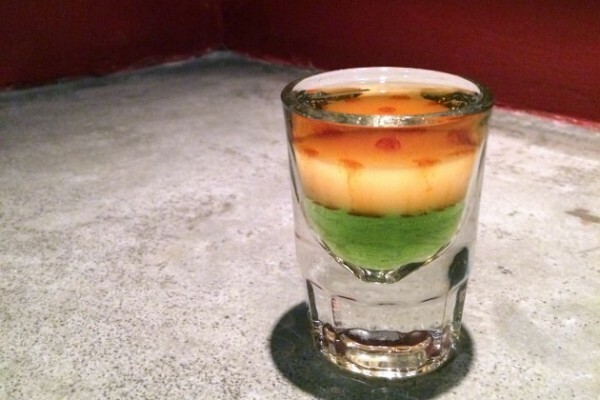 Especially at Downtown Cocktail Room, where the haphazard creation Finish Him ($14), will bring your evening to a swift, if blurry conclusion. Being layered equal parts green Chartreuse (110 proof) louched Kübler absinthe (106 proof) and Smith & Cross Navy Strength Jamaican Rum (114 proof), the shot is named for Mortal Kombat’s invitation to conquer one’s opponent with gruesome flair, and is therefore garnished with a few drop of Angostura aromatic bitters along the edges. You know, to resemble blood. So, how many shots did Kevin slip him?